Have you ever heard of Italian Easter Bread? I hadn’t until last year, when I happened upon it on Pinterest. 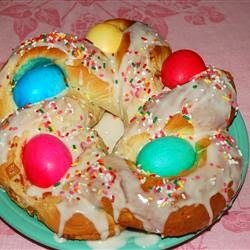 It is visually quite stunning – a plaited wreath of sweetened dough with dyed hard-boiled eggs placed in the wreath, plus some sprinkles. Very Eastery, not just because of the colours, but of course the eggs – which have all sorts of religious connotations. I’m not religious, as I’m sure I’ve mentioned before, but I still like the holiday and it's colours and tastes. I thought I would try making it this year, but then I mentioned Italian Easter Bread to Disneyboi who baulked at the thought! He’s not a lover of real eggs at all. I say real eggs, as he does like chocolate ones, which set me to thinking. How about a cookie made to look like Italian Easter Bread and instead of real dyed eggs, I could substitute mini chocolate eggs? I made a plain cookie dough and chilled it overnight. The next day I twisted lengths of cookie dough together (I cannot plait to save myself, twisting was much easier) and added some micro eggs, before chilling the unbaked cookies for a few minutes (helps them to keep their shape) before baking them. I tried both mini eggs and micro eggs and I have to say the micro eggs won. They did crack a little when baked, exposing their choccy innards, but I loved the look of them. When cooled I made a simple glaze from icing sugar and water, brushed it over the cookies and sprinkled some multi-coloured sprinkles – very festive! Disneyboi enjoyed these immensely and I think they would cheer up any Easter celebration table! In a mixer, beat together the butter and sugar until pale and fluffy. Add the egg and mix in followed by the vanilla extract. Add the flour and salt and mix until a dough forms. Split the dough in two and wrap each half in clingfilm. Refrigerate for a couple of hours at least or overnight. When ready to make your cookies, pre-heat the oven 180C. Line two cookie sheets with greaseproof paper. Split the dough into 40 grams balls and separate each ball in half. Roll each half into 20cm long snakes and place each snake side-by-side. Twist each end until you get a full twisted ‘log’. Wrap it into a circles and then take the micro eggs, dotting 5 or 6 around the folds of the dough. When all cookies are made, chill them for 15 minutes before baking in the oven for 10-12 minutes or until lightly browned. Allow to cool completely before making a glaze from some icing sugar and water, Brush over the cookies and sprinkle with sprinkles. Allow the glaze to dry before tucking into your Italian Easter Bread Cookies! 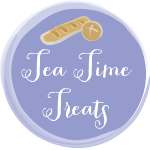 I am entering these into this month's Tea Time Treats hosted by (this month) Janie at The Hedgecombers and Karen at Lavender and Lovage. The theme is biscuits and cookies. Thanks Kat - perfect for Easter! These are fabulous! they would cheer anyone up, lovely! I got mine in Tesco Sammie, you can also pick some up in Home Bargains too if you have one near you. Thanks Heidi - yes very Eastery! Really tempted to have a go with these. So pretty. Cheers Sally, if you do, I hope you like them as much as I did. I love your Easter Bread Cookies, what a brilliant idea. Thanks Sarah, I must try and make the bread now! They look gorgeous and the cracked eggs just make it seem that chocolate chicks are about to emerge! Never thought of that Kavey! Little choccy chickies! I absolutely love these Stuart! I've never heard of Italian Easter bread either. Happy Easter when it comes Claire, and thanks! These cookies are so very pretty, love them and your photos of them too! These look great! Very creative. I can't wait for the Easter eating to start. Oooh they do look GOOD! Theses are lovely Stuart! Very pretty and unlike so many Easter bakes not too sweet! Yes, a wee bit lighter on the sugar, which isn't like me normally!! Pinterest is fab! Thanks for your kind comments Jeanne. 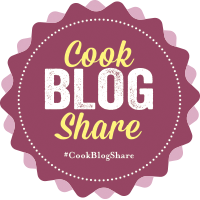 My pleasure Lucy - thanks for hosting! What a fun idea! Pinning for next Easter! Love all the pastel colours! they are such a fun easter bake! Absolutely love these, so pretty.